Wow! This one’s pretty spectacular! Like a negative photo of a Man Holding a Sun. Same idea as that one, only here we have Moon instead of a Sun, and girl instead of a man. It’s easy to produce such an illusion, but it’s hard to make it come up beautiful as the example below. For more similar illusions, check Relative Sizes category, specially Little Lighthouse, Launch Break Fun, Eat This and Girl Holding Columbus. Well, if it was Photoshopped, the only thing that was done, was placing a more distinct picture of the moon over the moon in this picture. But that is my humble opinion. agree with CJ. to get that kind of detail on the moon in the sky, you’ll need to have infinite focus – which would blur the girl out in the foreground. it could be done by focus bracketing, which requires some image editing. It’s not photoshop. 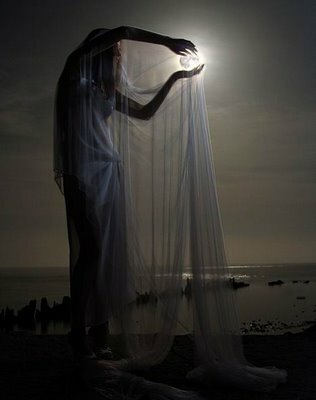 See this picture is because the moon is far from the woman in the picture and she can catch it. Why is the lighting so nice? You can see light dancing off the front of her torso; if she was being lit by the moon which is behind her, then her body would be no more than a silhouette. Also, the really subtle details of her veiled dress would be very hard to capture in low lighting conditions. And finally… How could you get such a nice balance of lighting without photoshop? Whenever I try to take a photo of the moon at night, the moon is immensely brighter than anything else and it either comes out as a cratered looking thing on a pitch black background, or if I put my night settings on it will be a blinding white disk while the other elements in the background will be greyish. Even if this was shot on site, it would have to be stitched together from multiple shots to make it look the way it does. At which point, the photographer will say to him or herself, “Let’s shoot this properly, in a studio, where I can control that lighting to the best of my ability.” Add a few choice stock images, and the art is made. Beautiful picture, I must say. The photographer probably used an off camera light or flash shining on the subject from above and to the right. Likely several images were shot to get the light strength in balance with the moon light to enhance the illusion.